Every year we plant one – one – courgette plant. Every year we still manage to have a glut. I’ve been getting more strict with these summer squash, always trying to pick them when they’re young and tender – and before they turn into monster marrows. But there are always a few that get away. Also a few that we *generously* give away in an effort to keep as many courgettes in circulation as possible. Ahem. All time favourite courgette recipe? 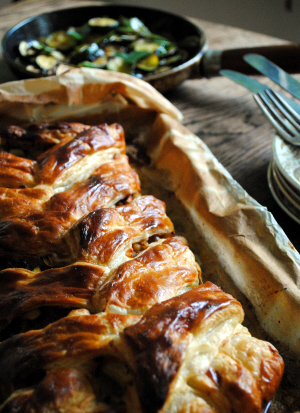 Spiced Courgette Cake is an annual treat but this Sausagemeat, Courgette and Apple Plait is the winning combination this year. It’s a reliable old recipe, originally found in the McDonnells Good Food Cookbook, and recently revisited with courgette in mind. I’ve also been eating a lot of the pan-fried courgettes with feta, lemon and mint that you seen in the top of the picture and Edible Ireland’s Chocolate and Zucchini Bundt Cake has just joined the must-cook list for the next courgette gathering. If you’re heading to the Electric Picnic over the weekend, the Theatre of Food in the Mindfield area of the Main Arena is well worth checking out with demonstrations from Paul Flynn, Derry Clarke, Kevin Thornton and Catherine Fulvio, Eunice Power’s paella party a beer vs wine face-off with the team from L Mulligan Grocer & WJ Kavanagh vs a wine panel which includes Shane Murphy, Ricardo Arambarri Perez and Caroline Byrne. I’ll be back there again talking about the ABC of Sweet Fermentation with Junko Hamilton – amazake, beer and chocolate. There’ll be talking, there will be tastings – and there might even be some back-by-popular-demand Knockmealdown Porter Brownies. That’s on Sunday 1 September at 6pm. Keep an eye on the Theatre of Food FB page for updates. It is worth getting your hands on some decent sausagemeat for this – the easiest way is to buy your favourite sausages and squeeze the meat from the casings. Preheat the oven to 200°C (180°C fan). 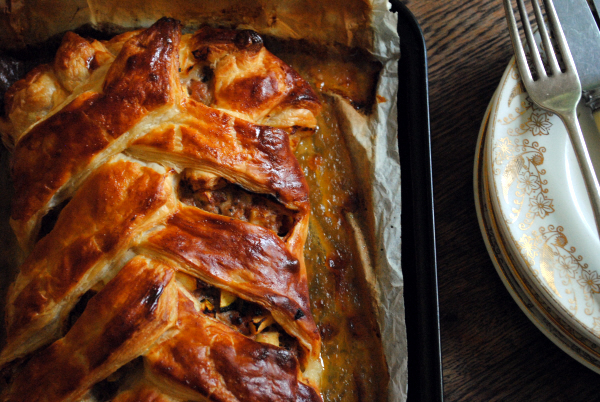 Line a baking sheet or Swiss roll tin with a sheet of greaseproof paper. In a large bowl, mix the sausagemeat, onion, tomato, courgette, apple, ketchup and thyme. Use a fork or your hands to combine the ingredients thoroughly. Roll pastry into a 35cm x 30cm rectangle on a floured worktop. Place on the lined baking tin. Spoon the filling into a sausage shape down the centre of the pastry. Leave a 2cm margin at either end. Cut 2.5cm strips at either side of the filling. Brush the pastry with the egg glaze, fold in the top and bottom ends then fold the strips across the filling, alternating sides so that they cross in the middle. (Picture here.) Finish glazing the top and bake in the preheated oven for 35-40 minutes until crisp and golden brown. Best served warm or at room temperature. Serves 4-6. This recipe looks great. We, too, have a glut of overly large courgette and, in recent weeks, millions of apples. This looks like an ideal way of putting them all to good use. There’s only so much jam and chutney I can make! Tks, J.
I love making jam and chutney but sometimes you just need something fast for dinner! This is also a good way of getting kids to eat their veggies – I’ve also been known to add a shredded handful of spinach. Looks lovely Caroline – looking forward to trying it out with the monster courgette sitting on the worktop!